Each 2 inch ceramic ornament is unique due to the handmade process. The front is stamped using a hand carved block of my creation. 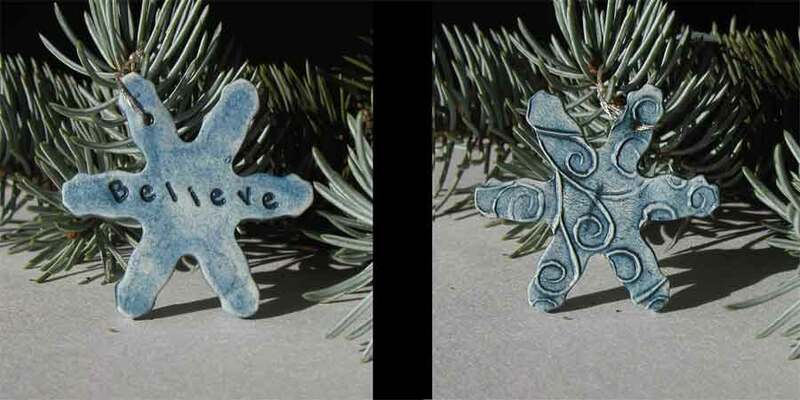 The backside is stamped with a word: Believe, Joy, Imagine, Hope, Love, Winter, Snow, Solstice, Peace. For the pet lovers I offer Woof & Meow. Each flake was gently wiped with a beautiful cobalt blue stain before firing to emphasize the lines. A perfect gift for any holiday party. Flakes will be sold in a mixed set of 4. Purchaser chooses their favorites from the above word list. Get ’em going as the season is short now!